Peekaboo! 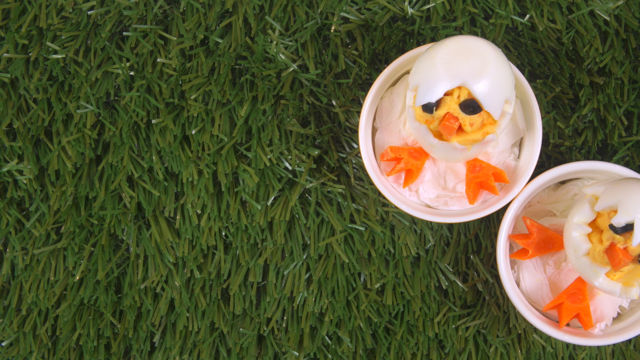 Adorable chicks peeking out of their shells makes this dish not only delicious, but creative and cute! Perfect as an appetizer or side dish for a fun-filled party like Easter! Boil eggs for 10 mins and let it sit for 10 mins in cold water. Cut the boiled eggs into half using alternate zig-zag lines. Remove the egg yolks and put into a mixing bowl and mix. Add Mayonnaise, Vinegar, Mustard and Salt and mix thoroughly. Cut carrots to form shapes for the beaks and feet, while cutting the Black Garlic to form the eyes. Using a piping bag or spoon, fill the empty egg whites with the egg mix. Add the beaks, feet and eggs and serve!